Patient Zero is a virtual pandemic simulator where you get to infect real players. Infections get transferred by players coming within proximity of each other in the real world. Players infected with your virus will carry it and infect more players. See how quickly your unique virus spreads! Three different virus types, each with unique properties. Leaderboard showing the most infectious strain. 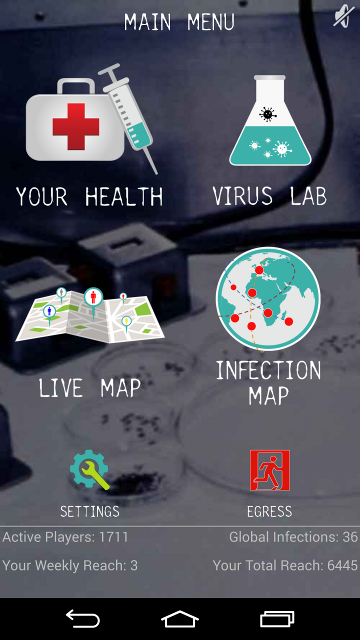 Live map view to aid in spreading your infection. Global infection map - See how far your virus has spread! Carrier status information - See what you're infected with. Text to speech enabled devices will even say player names as you infect them. NOTE: Other players will not be able to get your exact location, only a general idea. GPS and network location are supported. Finally, showing up to work with a nasty infection will no longer be frowned upon! The more players you infect, the greater chance your virus will become an unstoppable pandemic. Infect someone at the airport before they board a plane and the real fun starts! Try actively spreading your infection while you commute to work! Remember, this is a beta and not the finished product. There will be issues and I'm working as fast as I can to resolve them. Thanks for your patience! Email me with questions and feedback. New features the community demands are actively being developed!